It’s Spring in the Northern Hemisphere, and that means the Sun is back. But it’s more than just a free heat lamp for your garden, it’s an incredible, dynamic nuclear reaction complete with flares, coronal mass ejections, twisting magnetic fields and the solar wind. Put in your headphones, head outside and enjoy the sunshine while you listen to this week’s podcast. Solar Physics – Sun facts and basic info, links to recent papers and more. Episode 12: Where Do Baby Stars Come From? Fraser: Good, well I’ve got a very strange story for you. You know I live out on the west coast of Canada, on Vancouver Island, and we get a lot of rain here over the winter. This winter was particularly hard â€“ very, very rainy. So yesterday, it wasn’t raining and I decided to venture outside and there was something really strange in the sky: the clouds were on fire! Well, not exactly on fire, but there was some kind of burning orb peeking out from behind them. Fraser: The Sun? I’m intrigued, tell me more! Pamela: Well, it’s this nearby star and its been keeping us warm for about 4.5 billion years. Although in the past it used to be significantly cooler and its currently warming up, in about 5 billion years it’s going to stop the nuclear processes in its centre that keep it going. Between now and then, it’s going to about double in brightness. Fraser: (laughing) “And we’ll die.” Well as long as you put that inâ€¦ So this orb will kill me?? Pamela: This orb will kill you. Fraser: Seriously though, the weather is finally turning here in rainy Vancouver island and we just had the first day of spring in the northern hemisphere, I think that’s how it works. Also (and I think this is the coolest part) the Hinode spacecraft just released a series of animations of the Sun’s surface, and they will blow your mind. I have never seen anything like this. They’re these really close up animations of plasma moving around on the Sun’s surface. So we’re going to put a link to that in the show notes. This week, we want to talk about the Sun. So let’s talk about the Sun: what do you know? Pamela: Where do you want to start? Fraser: There’s got to be layers to it. In the very centre of the Sun, we have this very, very dense, very, very hot region sort of like the centre of a nuclear explosion. In fact, it is a nuclear explosion. In the core of the Sun, we have protons slamming together with so much energy â€“ well, energy is not just what they’re slamming together with, it’s what they’re releasing. These protons, when they collide, will actually first form deuterium and then eventually you’ll get deuterium colliding with things and other things going on and you end up with Helium and then helium collides and you end up with a new form of helium. Along the way, in these collisions, energy is released in the form of light and neutrinos. Fraser: What’s making this reaction happen? Pamela: You simply crush stuff together closely enough and heat it up, and the heat causes the atoms to move; heat anything up and it gets excited and runs around. Everything is packed closely together, and when a whole bunch of stuff is packed closely together and trying to move at high velocities, it can’t help but collide with one another. So these atoms are heated up, packed closely together, and colliding. Along the way, when they collide, they’re producing heavier elements and releasing light in the form of gamma rays and x-rays. Fraser: So the fusion process is actually the atoms vibrating into other atoms so hard that they merge together? Pamela: They’re colliding, they’re racing around in a swarm of different velocities and different directions, colliding together, merging to form heavier atoms and releasing light. Fraser: Is that where the light from the Sun comes from, then? Pamela: Originally, but that light goes through a lot of processes before it finally reaches the planet Earth. Like I said, initially, they start out as gamma rays and x-rays. Thankfully, the Sun isn’t hitting the Earth with gamma rays and x-rays because that might (over time) do really bad things to our atmosphere. Instead, that light races away from where it was formed. The inner 25% of the Sun is where these nuclear reactions are taking place. That light shoots off in all directions, but as it tries to shoot off, it ends up hitting other atoms in the Sun and it’ll get absorbed into the atom, carried along for a little while, and then re-released sometimes with a different colour, a different temperature, and then it will continue on. These absorptions, scatterings, re-emissionsâ€¦ this will happen 10^30 times, that’s 1 followed by 30 zeros different times as the photons of light try to move from the core to the surface of the Sun. This process can take a photon 10 million years. Fraser: It takes 10 million years from when the photons were created in the nuclear process to when they can actually get out of the Sun! Pamela: It’s kind of shocking. Every photon has to be around for 10 million years before it gets to the surface and then it takes it a meager 8 minutes to reach the planet Earth. Fraser: We talked about, in one of the earlier shows, how it’s the light pressure from those photons that’s counter-balancing the gravity pressure of the star itself. Is this what this light pressure is, these photons bonking into their next absorption target? Pamela: That’s exactly what’s happening. The centre of the Sun is releasing all these photons and they’re trying to escape, trying to escape and as they try to leave, they’re pushing on the outer layers. Think of it this way: imagine you have a steady stream of famous people being produced in the centre of a crowd and these famous people are trying really hard to push their way out the edge of the crowd but as they go everyone’s grabbing a hold of them, demanding an autograph and sometimes they end up going off in the wrong direction initially before they finally get to the edge of the crowd. Fraser: And they probably get grumpier and grumpier and grumpier as they go until they’re able to make it out. Pamela: And with photons they get lower and lower energy as they go. Fraser: But I know that gamma rays and x-rays are coming from the Sun, so is that just some of the photons are able to make it out unchanged while others do get changed pretty significantly? Pamela: There are actually processes at the surface of the Sun that can create new hot photons. We have magnetic field lines poking up through the surface of the Sun and these magnetic field lines contain huge amounts of energy and they’ll get themselves all twisted up (see image below: credit Hinode JAXA/NASA). Sometimes they’ll spontaneously reconfigure into a simpler shape. When they do this, they release the energy that it took for them to stay in the complex shape and that energy comes off as really hot photons. Fraser: So the x-rays and the gamma rays that we see coming from the stars are not the original ones that were generated in the middle, they’re produced at the surface. Let’s go back to our layers then, so we’ve talked about that inside layer where the nuclear reactions are happening, what’s outside of that? Pamela: So the inner 25% is the core, and then next up to 70% out from the centre of the Sun (so you go from 25% out to 75% out) there’s this radiative zone (see image right, credit: NASA/SOHO). This is the area where the light is getting absorbed and re-emitted and absorbed and re-emitted. Eventually it reaches this layer where the Sun basically becomes a giant lava lamp. As the radiation comes out of the radiation zone it goes through this layer and starts heating up gas. 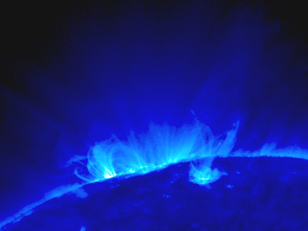 The heated up gas starts to rise so you end up with cells of rising, hot material going towards the surface of the Sun. When it reaches the surface of the Sun, it radiates away its energy, cools off and sinks back down. This is the same process that’s going on with a lava lamp. You have a hot light (a light bulb) underneath the lava part, and that light is heating up blobs of the oil inside the lava lamp, which then rises, cools off at the surface and sinks back down. The Sun has the exact same radiation level followed by lava lamp level. Fraser: But when I think of the Sun, I think of it as all gas, right? The inside is hydrogen gas, but I guess it’s in this radiation thing. With this outer layer, it has a chance to radiate away into space and so its not quite as hot, not quite as intense as the rest of the Sun? 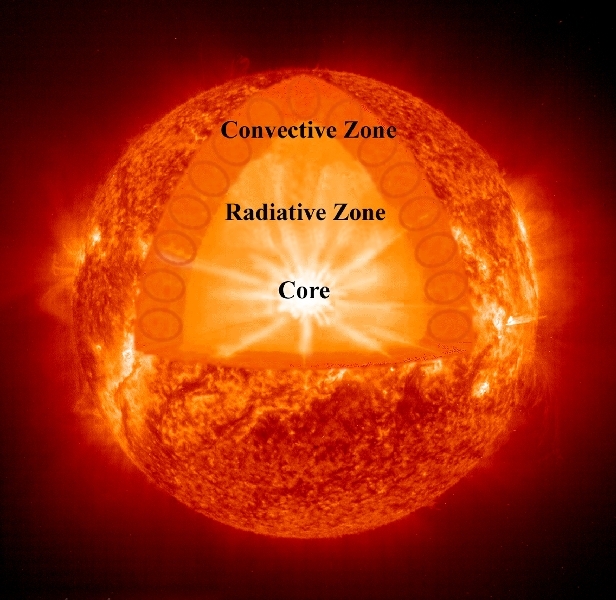 Pamela: The temperature structure of the Sun changes radically as you go from the centre to the outer layers. The very centre of the Sun is about 15 million degrees Celsius. As you go out toward the surface of the Sun, the surface of the Sun is about 5 thousand degrees, or 5,700 degrees Kelvin. That’s a huge change in temperature. This change in temperature happens in a large amount across the radiative zone, where the temperature falls from about 7 million degrees to 2 million degrees. At the bottom of the convective zone, it has to go from that 2 million degrees all the way down to the 5,700 degrees at the surface. So in each of these different temperature regimes, you have different physics dominating how the gas behaves. Fraser: In this convective zone, we’ve got these bubbles of gas boiling up to the surface, releasing their energy, cooling down and then sinking back down. What does that look like in our telescopes? What do we see? Pamela: We can actually watch the surface of the Sun boil the same way oil in a pot boils, where you get granules of material coming up and then streaming back down. We’ll put links to these animations on our website; it’s just all these individual cells where you can watch them flowing up in the centre and down on their edges. All the edges intermix and they slowly change shape and move around and it’s fascinating to see the Sun do the same thing that happens when I’m cooking sopapillas. Fraser: Yeah, the photos of the Sun doing this kind of stuff are just astonishing. So, let’s talk about some of the other features on the outside. You talked about the magnetic field lines. How does that happen? Pamela: At the transition layer, between the convective zone and the radiative zone, there’s a lot of weird physics going on. We talk about the Sun’s magnetic field being generated by magnetic dynamo that occurs in the interface between the radiative zone and convective zone, and I have to say we’re not entirely sure how it happens. But, however it happens, it occurs at this interface and you end up with magnetic field lines streaming away from the magnetic dynamo and in some places they come up through the surface of the Sun and one of the really weird things is this magnetic field, the north pole of the magnet and the south pole of the magnet will actually flip back and forth over 11 year periods. So we have a magnetic field getting generated at the interface between the radiative zone and the convective zone, and it’s an unstable magnet that flips back and forth. Different magnetic field lines pop up through the surface of the Sun, create really weird shaped structures, and leave footprints in the form of Sunspots where they’re poking up through the surface. Fraser: Oh, so the sunspots are the places where the magnetic field lines are poking up through the surface of the Sun. I didn’t know that. Fraser: When we talk about this 11 year cycle, this is the solar maximum and solar minimum, right? Pamela: Exactly. The number of sunspots we see on the surface of the Sun varies from year to year over an 11 year cycle, more or less; it occasionally betrays us. There was one marked period from about 1645 to 1715 where there were no sunspots, but in general it’s a nice, healthy, 11 year cycle. We went through solar minimum about 2005 and the number of sunspots changes and where on the Sun the sunspots are located also changes. During solar maximum, we have the most sunspots. They’ll star to appear in the northern mid-latitudes and the southern mid-latitudes of the Sun. As we move toward minimum, the sunspots move toward the equator. Fraser: So where do we stand now, then? We’re a couple years past the solar minimum, heading toward the solar maximum again. Pamela: Exactly. So the sunspots are starting to crop up at the mid-latitudes, we’re starting to get higher numbers of them, and it’s a good time to watch the Sun evolve because it’s going to start to do more and more things as we watch. Fraser: I’ve heard that this upcoming solar maximum is supposed to be pretty significant. Pamela: We try to make predictions about how many sunspots we’ll see, what we expect to see and right now they’re expecting the next solar maximum is going to have more sunspots than the previous solar maximum, so it should be fun to watch, and we have more satellites in orbit than ever before, trying to watch what’s going on. Fraser: That’s right, we’ve got the Hinode spacecraft, that I mentioned, and there’s the new STEREO spacecraft that was just launched as well. Those are put, I think, one space craft trailing the Earth and one ahead of the Earth in our orbit, and they’ll be able to make a 3-D picture of the Sun’s surface as well as any things that happen on the surface. Let’s talk about some of those things they might see. I know there’s a few other terms we have to get through, one is flares. What are those? Pamela: Flares occur when those magnetic field lines reconfigure and in the process they have to break. When this happens, you end up with the material streaming away from the broken field lines. This is a magnetic flare â€“ at least, this is how we think we understand it. We’re still learning new things every day, and magnetic fields are one of those things that are really hard to understand. The Sun, even though we’ve been able to see it as long as humanity’s been around to watch, we’re still learning new mysteries about it every day. Pamela: Coronal mass ejections are one of the most exciting mysteries there are in solar science. They seem to be associated sometimes with sunspots and the flares that are associated with the reconfiguring of the magnetic fields, but sometimes they just seem to happen just because, and we’re not always completely sure why. We’re working to try to figure out how to make predictions. 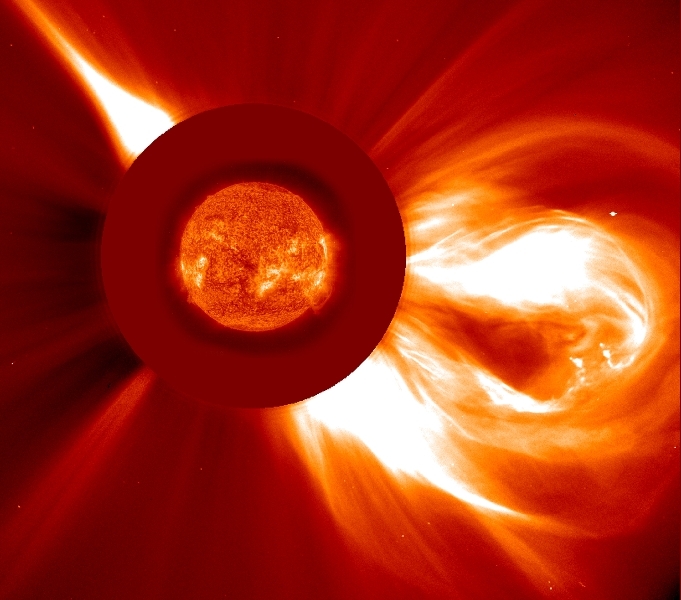 Understanding coronal mass ejections is actually fairly important because when these things happen, they can release huge amounts of energy that can harm astronauts and satellites that are orbiting the Earth. 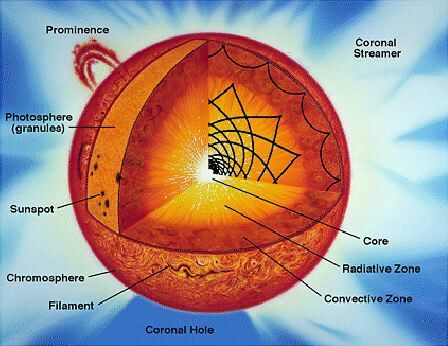 Fraser: But what’s actually in a coronal mass ejection? Pamela: Well, it’s a lot of high energy particles. You get particles coming off the Sun at high energies, streaming toward the Earth and they can cause all sorts of weird interferences as they hit the atmosphere, and there’s also radiation. So a lot of bad stuff can hit our atmosphere all at once when one of these things happen. Fraser: Our understanding of the Sun so far, has that affected our understanding of some of the other stars we can see? Can we see some of the features on the Sun â€“ like, can we see some of the features that we see on our Sun, on other stars? We can also watch stars change in brightness in ways that we believe are due to star spots. If you get enough star spots on a star, it will change the amount of light coming off of the star and we can see that happening. There’s all sorts of complex programs out there to try and reconfigure using extremely high-res images what those sunspots might look like. Fraser: That might be a way then, you can detect the rotation speed of a star. Pamela: In some ways it’s easier to look at the line broadening because the left edge of the star might be rotating toward you while the right edge rotates away from you, and we can use that difference in the rotation rate of the two edges to get the rotation rate of stars, but we can also use star spots. Fraser: So, you mentioned at the beginning of this podcast, we’re talking about what the future holds for the Sun. We’ve got a more elaborate podcast about how stars die, but can we talk a bit about the future for our Sun? Pamela: Sure. The Sun right now is burning hydrogen in its core, producing helium. This is all confined to a region that is at a high enough temperature and pressure to allow protons to get close enough together that they can merge together to form different elements. Most of the time, when two protons get together their electromagnetic forces between them will cause them to try to repel one another, but if they’re going fast enough, they don’t have time to react and they’ll get close enough that a different force will take over and they’ll merge together. Now, the whole Sun isn’t at a high enough temperature/pressure to allow nuclear reactions to go on. So eventually, all of the hydrogen in the part of the Sun capable of nuclear burning is going to get used up, and when that happens the Sun is initially going to start to collapse down. As it does that, it will create a new layer, a new shell, around that core that’s capable of hydrogen burning. So that shell will burn hydrogen, burn hydrogen, burn hydrogen, and the hydrogen in that shell will produce helium, and that helium is heavier so it sinks towards the core. So the core is getting denser and denser and denser and hotter and hotter and hotter until eventually it reaches a temperature around 100 million degrees Kelvin, at which point helium is capable of starting its own nuclear burning. The helium is going to go into what’s called a CNO cycle, that ends up producing carbon, nitrogen and oxygen in different stages. So now, we have the core of the Sun burning and the core of the Sun burns, and the core of the Sun burns, and we still have this shell of hydrogen going. This is going to, over time, build a carbon core to the Sun. Our Sun doesn’t have enough mass that once it gets a nice carbon core it’s going to be capable of then burning that carbon core into anything. But, it will then (once it has the carbon core) go through one more phase and in that last final phase it’s going to be a supergiant star. It’s going to be something resembling a Mira variable star: big, bright, large variations, easy to see. It’s going to be undergoing helium shell burning and hydrogen shell burning, so you have this onion layered Sun, where the core is this remnants of the carbon-nitrogen-oxygen cycle, you have a helium burning shell around that, and a hydrogen burning shell around that. Now, once that fuel is burned up, the Sun is just going to sort of fall apart. The outer layers of the star are going to drift away and form a beautiful planetary nebula, something like the Helix nebula (see image below: credit NASA). The core of the Sun is going to get left behind as a white dwarf star. That white dwarf star doesn’t have the ability to produce anymore energy, so it can’t support itself except by the atoms pushing one another apart. That leftover core of our Sun is going to collapse down to roughly the size of the moon. The atoms are going to get so close together that they’re essentially going to form a crystalline structure similar to the most dense diamond you can imagine. That white dwarf, over time, is going to slowly cool off and cool off and cool off until it fades away, given the length of the age of the Universe. Fraser: That’s â€“ it’s kind of ironic that the Sun gets hotter as it runs out of fuel. It just seems strange to me. Right now, the Sun is getting hotter and hotter and hotter, isn’t it? Not that you can notice over a couple of years, but over millions and millions of years the Sun is becoming hotter. Pamela: In about 50 million years it’s going to be hot enough to do bad things to the water on the surface of the planet. The many ironies of the way stars evolveâ€¦ when they first start out, that initial burning is able to support a fairly small star, but the future hotter burning that’s going to happen is going to cause the star to bloat out until it’s roughly one and a half times the Earth’s orbit in radius. So the Sun will grow to be bigger than our Earth’s orbit by 50% before it dies. Fraser: And what does that mean for the Earth? Pamela: Well, along the way, the Sun actually loses lots of mass, and when the Sun loses mass its planets move away because the gravity isn’t pulling on them quite as strongly. We’re not quite sure how these two things are going to play out: the mass loss allowing the planets to escape to larger distances and the star expanding. But, some of the papers that I’ve read most recently have indicated that the mass loss is going to allow the Earth to get far enough away from the Sun that it’s not quite going to get sucked in. But, like I said, the Sun’s going to get twice as luminous and because of this, the surface of the Earth is going to get burnt off, basically. We’re not going to be around. So we need to figure out how to get even further away and find someplace that is safer. Fraser: So, with all of the new instruments that are going up to the Sun, what would you say are the big mysteries that scientists are trying to solve about the Sun right now? Pamela: Trying to understand how changes in the apparent magnetic field lines, the places where we can see hot x-ray emitting gas twisted up into bizarre shapes going between sunspotsâ€¦ understanding what specific shapes indicate that a flare or coronal mass ejection is about to happen is probably one of the most interesting thing. Pamela: And useful. New pictures that you were talking about from the Hinode (see above, credit: Hinode JAXA/NASA), those we think are starting to give us proof that when you find a twisted up S-shaped, x-ray emitting thing, that thing is going to break apart and we’re going to get a flare or a coronal mass ejection. Fraser: Once again, I think it’s going to be a good time for this kind of astronomy as well. We’re just totally in the golden age of astronomy. It’s great. That was great, Pamela. Thank you very much for explaining what that burning orb was, now I feel a little safer but I’ll keep an eye on it. And we’ll talk to you next week. Pamela says it takes 10 million years for energy from the core to be emitted at the surface, but the show notes (non-math) says 170,000 years. Love the show. This is the first time I viewed the show notes. Love them too. Best wishes for new year. Love it, love it, love it. Both Astronomy Cast and The Universe Today. I wonder, is there any forces binding Pamela and Fraser together that would make Ms. Cain jealous? Is that why your going to school for computer programming? To impress Pamela? I mean it seems Fraser has accomplished quite a bit thus far: Astronomy Cast, Universe Today, started two fortune 500 companies, there must be forces at work here we just don’t see, a dark love perhaps? Seriously though, you guys are great! Really enjoy the podcasts. It’s a bit late (in terms of the internet but not so much in terms of the Universe) but I noticed a mispronunciation. Hinode – the Japanese word for sunrise – is pronounced He No deh. Short ‘i’, long ‘o’ and short ‘e’ at the end. I’m a little behind listening to the podcasts but I wondered about one thing in episode 29. Pamela said the earth’s water will evaporate in 50 million years. Is that right?